Most of the times Companies must have faced difficulties in finding a suitable candidate for their esteemed organization. They always wanted to get associated with an HR consultancy who can hire desired candidates for them at the right time. 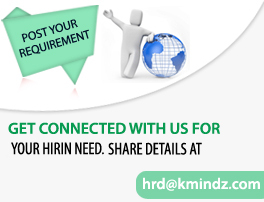 "K-Mindz Advisory Services" is into the field of HR consulting, committed to cater the demand across the Industry. 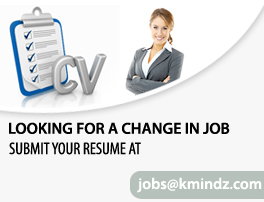 Kmindz was formed in the year 2008 and commenced its operations from Faridabad, Haryana India. we specialize in Executive Search, Placement & Training. We are equipped with vibrant and qualified team advancing towards the goal of providing timely and finest service. Our self-motivated Training and HR team are engaged by several top companies to deliver organizational support through staffing solutions in compliance to the clients' requirements. With sincere endeavors in providing value to employers and jobseekers in the dynamic environment and competitive marketplace, we aspire to carve a niche in the Indian consulting industry. We, at K-Mindz Advisory Services take an opportunity to solve this issue with a different approach never seen before and offering you the following services. Our services range from the entry level to the Top level. We screen the CV's according to the Client's requirement and forward them to the Client for the short listing process. Conduct the screening round as per client requirement at our end. K-Mindz advisory services promise great speed, accuracy, information and follow-up to Provide "value" of the service. Arrange the Interviews by coordinating with the client and the candidate. Coordinate with the client and candidate for salary negotiations and joining date.